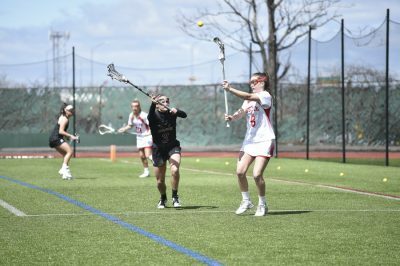 The Boston University women’s lacrosse team suffered an 18-6 loss during its season opener Saturday afternoon, falling to rival No. 4 Boston College at Nickerson Field. The Terriers (0-1) knew this game would be no easy matchup as the Eagles (3-0) were ranked No. 4 in the nation coming in, after wins against then-No.15 University of Notre Dame and the College of the Holy Cross this season. BC opened the scoring early, as a BU turnover allowed junior defender Elizabeth Miller to score just 40 seconds into the matchup. The Terriers struggled to gain much offensive momentum throughout the first half. The Eagles held possession of the ball for most of the period, as 12 turnovers prevented the Terriers from getting good looks on offense. Junior attack Sam Apuzzo provided an additional offensive spark for BC, scoring four goals, including a hat-trick in the first half, and collecting four assists. She now has 20 points on the young season, leading the team. Junior midfielder Dempsey Arsenault also played a large role for the Eagles, leading the team with five goals and five ground balls. After an 8-0 run by BC to begin the game, BU was finally able to get on the board thanks to a goal from sophomore attack Kailey Conry. The Terriers managed to get another shot past junior goalkeeper Lauren Daly with 3:30 left in the half when junior midfielder Kelly Mathews scored her first of two goals on the day, thanks to an assist from Conry that left Mathews open in front. The Eagles took a 12-2 lead into the half, but Robertshaw noted that her team was determined to continue fighting. BU put on better defensive pressure in the second half as well, preventing BC from getting inside and close to the net as they had been doing in the first half. Sophomore goalkeeper Bianca Smith came into the game with 20:56 remaining in the first half, in replacement of senior goalkeeper Christine Laible, and made a career-high 11 saves, and posted a .478 goal save percentage. Daly made eight saves on the day for BC, earning a .571 percentage. The scoring was much more even in the second half, as the Eagles only outscored the Terriers 6-4. Senior attack Avery Donahoe scored the third goal of the contest for BU after managing to get off a bounce shot while falling down in front of the crease. Additional goals from Conry and Mathews came at 17:35 and 11:06, respectively. Conry finished the day with two goals and two assists, and now leads the team with four points. The Terriers’ sixth and final goal came from freshman attack Bridget McCarthy, the first of her collegiate career. As for the other freshmen making their first appearances today, Robertshaw noted this was an important game for them. The Terriers will look to rebound next Wednesday, when they take on the University of Massachusetts Lowell on the road.